The Bloody Inn is a hand management game where each card can be used in a number of different ways. 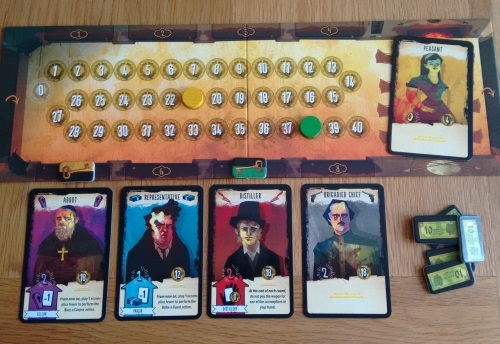 It has a wonderfully macabre art style and theme, although it won’t be to everyone’s taste: each player is part-owner of an inn where a goodly number of patrons are robbed and murdered – with the player who makes the most profit from this being the winner. In the small box you’ll find 80 cards, a small board depicting the inn and around 70 chits and tokens – not bad for the £20-ish you’ll pay for it. As mentioned the card art style will be loved by some and not others, but the overall component quality and graphic design is definitely above average (including linen finish cards). The game length is listed as 45 minutes to an hour, which is about right. There is a shorter version of the game listed in the rules, but I wouldn’t recommend it – you run out of time before you really get a chance to get your engine going, which can lead to a pretty disappointing experience. It is also listed as one-to-four players, but the solo game is a tacked-on ‘beat your last score’ cop-out. However it plays very well between two and four. Anyone who has played the likes of Bruges and San Juan will be on familiar territory here, while others with a basic grasp of action selection and hand/economy management will pick it up fast. Every card in the game can be used to do any of the common actions and you’ll get two actions each round. Each card has a number value on it (between 0-3) and this cleverly equates to the cost (in cards) of any action you want to do with it. The ‘bribe a guest’ action lets you pay an amount of cards equal to a guest’s value to put that card into your hand. Luckily there is also a small stack of ‘value 0’ peasant cards that, if available, you can grab two of for a single action. So to bribe a value 2 card from the inn into your hand, you could spend two peasant cards (remember every card is worth 1 in terms of completing these actions). 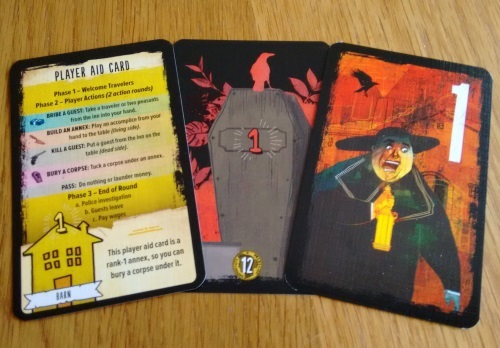 Alternatively you can spend cards in your hand to kill a guest at the inn (flip them face down in front of you to their coffin side! ), build an annex in your play area (handy for both special abilities and for burying corpses under…) or bury one of your murdered corpses and claim their belongings (read cash – which also equates to victory points). As mentioned earlier, cards are usually ‘spent’ to carry out actions with guests who have a value higher than ‘0’. Guests spent in this way go to the discard pile, while peasants go back to the inn (so you have a semi-regular way to get more hand cards). However each guest card has a colour equating to their profession and if they’re used for that particular job they go back to your hand once used, rather than being discarded (religious cards, for example, aren’t discarded if they’re used to do a burial action). The game’s actions have a simple, thematic flow and just make sense, while the single currency for all actions makes it simple to catch on to. Guests used as an annex simply help you improve your engine in a variety of ways – from allowing you to spend less cards to do certain actions/do more with an action, to earning extra money from guests or giving end game victory points. The writer: As with all great action selection games, two actions is never enough in The Bloody Inn – you always want to do more than you can. But at the same time your choices are relatively limited, so there doesn’t tend to be a big ‘analysis paralysis’ problem. And the game has so many clever, simple innovations. Take cards in hand not being discarded if they’re the right type – this sounds great, until you realise you have to pay one money at the end of each round per card in hand as wages – and that isn’t optional. Its conundrum after conundrum. The great player aid also doubles as a starting annex – and I’m a sucker for that kind of ingenuity! The thinker: This is one of the better light euro games I have played, thanks in no small part to the economic side of the game. The way money (read: victory points) works is that you can only have 40 cash on hand at any time – if you want more, you have to spend an action laundering some of this cash into ‘cheques’. You have to do this to amass victory points, but it costs a precious action each time – and when you think a level 3 guest will net you 26 cash when buried you’ll find yourself laundering more often than you’d like. The trasher: While interaction isn’t huge, there can be some real tension. Some guests are police and any alive at the end of a round snoop around – bad news if you have unburied corpses as you pay a fine and lose the body! This creates great scenarios as you work out who cares about law men that round: will they all be gone, or do I need to bury someone right now? Especially as you can bury them in other players’ annex space, whether they like it or not (you just have to give them half the cash). Also end game scoring cards are visible to all and score points for certain types of card in the discard pile – so you want to keep that type of guest out by either hiring them or killing them off! The dabbler: While I enjoyed the style and theme of The Bloody Inn it’s definitely something to consider. The two complement each other well but the theme is in every aspect of game play – from the coffins on the backs of the cards to the bribe, gun and coffin symbols on various cards. But this integration of theme is also one of the games strongest suits, really helping in the teaching of the game and in creating a fun (if dark) comic air around the table talk. You also don’t need to fear that it’s a ‘cards with words’ game – many cards are duplicated and/or do very similar things, so it doesn’t take many games to become very familiar with all the options. The biggest knock on The Bloody Inn right now is the lack of variety in the cards. While this is good from a learning perspective it would seem to limit the game’s replayability if it’s something you wanted to play often. This isn’t a problem for me as I like to play a large variety of games, but it could prove problematic in a smaller, heavily played collection. I certainly hope the game gets an expansion, but the fact publisher Pearl Games is yet to produce one for the very popular Deus release (from 2014) doesn’t fill me with optimism. However it has previously backed both Troyes and Ginkopolis with expansions, so fingers crossed. Another limiting factor is that many of the cards seem to have pretty weak powers once made into an annex, which further limits strategic choice. Here the simplicity of the ‘0-3’ values of the cards becomes a hindrance for the game, as some cards of the same rank are very clearly more useful than others in almost any circumstance. Again, this could be solved easily with an expansion. Others won’t like the tightness of actions, as two per round really is agonising and it can feel as if the game ends just when you’re starting to get your engine running. That said, many like it for the exact same reason: it’s very much horses for courses in that regard. Finally it can sometimes feel as if things get going too slowly – each player starting with a level 2 annex ability (perhaps drafted?) could really have helped here, which is something I may experiment with as a house rule. I have fallen for the charms of The Bloody Inn, both in theme and mechanics. But while I’m glad to own it and consider it one of my current favourites, I can equally understand those who are critical of it. The combination of multi-use cards and paying for cards with other cards puts two of my favourite mechanisms in the box, along with action selection (another favourite). I also love the feeling of not being able to do everything I need too (I love that challenge in a game) and the tough economy, so this was always going to be a winner for me. If that sounds like your cup of tea, this is a very cheap investment for a strong title that (even if you don’t think it has great longevity) will give you at least a solid 10 plays out of the box. But without some support by way of expansions, this could run out of steam faster than it deserves to – and that would be a real shame. This is because, despite the components and price point, this is very much a euro game first and a card game second. 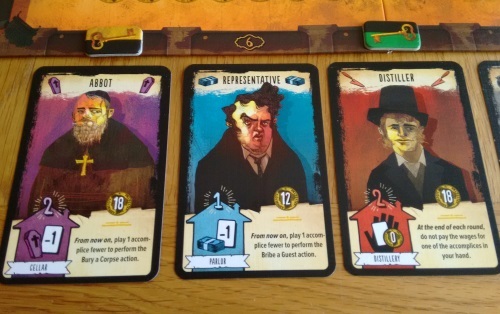 The Bloody Inn relies on the engine building, not the interaction, and games such as these need to provide variety to keep from buried under the annex themselves.